Thrill Experiences collects two types of information during your visits to our Site. First, we collect non-personally identifiable information. When visitors come to our Site, we collect and aggregate information indicating, among other things, which pages of the Site were visited, the order in which they were visited and which links were "clicked." Collecting such information involves logging the IP addresses, operating system and browser software used by each visitor to the Site. Although such information is not personally identifiable, it may be possible to determine from an IP address a visitor's Internet Service Provider and the geographic location of the visitor's point of connectivity. We also use "cookies" and other tracking technologies to collect non-personally identifiable information regarding you. Cookies are alphanumeric identifiers that we transfer to your computer's hard drive through your Web browser. Cookies make it possible for us to recognise your browser when you visit our Site. By doing this, we can personalize your return visits and save you time during checkout. Your browser must be set to accept cookies in order for you to enjoy the benefits of being a registered user of the Site. Second, we collect personally identifiable information. In general, our Site uses order forms, registration forms and newsletter request forms so that you can request information, products and services from us. These forms require that you provide us with personally identifiable information (such as your name, email address, physical address, telephone number, and where you make a purchase, a credit card number). 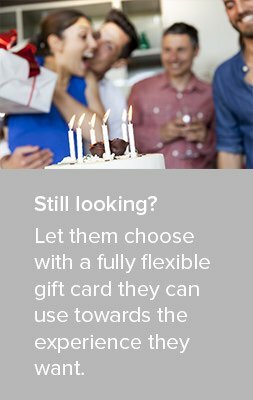 Further, where you use the Site to purchase a product or service as a gift, we will collect from you personally identifiable information regarding the gift recipient or potential gift recipient. Please take some time to familiarize yourself with the different ways that Thrill Experiences uses the information that we gather. Keep in mind that, while we encourage all third parties involved in running our business to adhere to our policies regarding the privacy of our visitors and to otherwise handle personally identifiable information in a responsible manner, we cannot and do not assume any responsibility for any actions or omissions of third parties, including the manner in which they use information received either from Thrill Experiences or independently. Thrill Experiences uses non-personally identifiable information, such as your IP address and the pages that you visit on our Site, to help diagnose problems with our servers and to administer our Site and improve Site-related services and features. Your IP address and other non-personally identifiable information also may be used to gather broad demographic information and to recognize customer traffic patterns and Site usage trends. This information aids us in merchandising and in developing the design and layout of the Site. We also may share aggregated statistical data and other non-personally identifiable information with our current and potential business partners, and with our service providers. Thrill Experiences uses personally identifiable information collected from you to complete transactions initiated by you (such as the sale and delivery of products and services). Your personally identifiable information is also used to get in touch with you when necessary. We may also use personally identifiable information to contact you to make sure you are satisfied with our goods and services or to find out how we can serve you better. Further, we may use personally identifiable information to conduct in-depth marketing research regarding our customers and potential customers. Financial information (credit card numbers, credit card expiration dates, billing address, and so forth) is used to bill you for products and services. You may, from time to time, receive information from us regarding new features, new products and services and special offers we think you'll find valuable. Also, while we won't share your email address with other companies, we may rent, sell or exchange your mailing address and information about your transactions with businesses that we believe to be reputable and that can provide you with offers and information that we think will be of interest to you. If you'd like to opt out of receiving future mailings from Thrill Experiences, or if you would like to opt out of Thrill Experiences providing your mailing address to third parties, please follow the procedure outlined in the opt-out section below. Thrill Experiences also may use your personally identifiable information to "pre-populate" forms that are used by the Site to facilitate transactions with us. Other types of use by us of personally identifiable information are discussed below. As noted above, we collect personally identifiable information regarding gift recipients and people to whom you may wish to give gifts in the future. This is done in order to accommodate proper gift delivery to such recipients and remind you of upcoming gift-giving occasions. We do not sell or rent any personally identifiable information that you provide to us regarding such persons, but gift recipients may, from time to time, receive offers from us regarding new features, new products and services and special offers we think they will find of interest. Also we may send marketing offers to gift recipients on behalf of ourselves and our business partners. In connection with such offers, we allow gift recipients to opt out of receiving future marketing-related mailings from us. We work with third parties who provide services, including but not limited to website hosting, order processing and fulfillment, credit card clearance, e-commerce affiliation, data analysis, emailing and other services of an administrative nature. Personally identifiable information, including financial information, is shared with such third parties for the purpose of providing such services. As a natural consequence of the development of our company, we could be sold to another company. In the event that we are acquired by another company or a significant portion of our assets is sold to another company, all of the customer information including both financial records and consumer information that we have collected may be transferred to the new company. We do not disclose an individual customer's personally identifiable information to third parties for third-party direct marketing purposes if we have received and processed a request from that customer not to have his or her personal information shared for this purpose. You may submit this type of opt-out request by email to privacy@thrillexperiences.com.au or to the following mailing address: Customer Service, Thrill Experiences Pty. Ltd. PO Box 30, Hastings, VIC 3915. In addition, we also allow you to decide whether you want to receive further marketing information from us. If you do not want Thrill Experiences to send to you announcements or special offers by email, please email us at remove@thrillexperiences.com.au with "Remove" in the subject line. If you'd like to be removed from our catalog and postal mailing lists, please send your request to the following address: Customer Service, Thrill Experiences, PO Box 30, Hastings, Melbourne, Vic, 3915. Please allow up to two weeks for your request to be processed. Thrill Experiences sometimes administers online surveys in connection with the Site in which we ask you for demographic information and opinions. We do not ask you for personally identifiable information as part of a survey. We use the collected survey data on an aggregated basis to better understand the needs of all of our customers. Thrill Experiences may send to you periodic announcements regarding status updates, service changes concerning the Site and other administrative matters. Subject to applicable law, we reserve the right to release information concerning any Site visitor where such visitor is believed to be in violation of his or her obligations to us, is partaking (or is suspected of partaking) in any illegal activity, in response to law court requests, to protect the interests of Thrill Experiences, our customers or others, and as otherwise permitted or required by law. Emails from Thrill Experiences or its business partners, and the Site itself, may contain links to other Internet websites, including sites that may or may not be owned or operated by Thrill Experiences. Unless otherwise explicitly stated, we are not responsible for the privacy practices or the content of such websites, including such sites' use of any information (such as IP number, browser type or operating system) collected when email recipients or Site visitors click through links to those sites. If you visit such websites, we encourage you to become familiar with the privacy practices of the sites. Thrill Experiences seeks to use reasonable security measures to help protect against the loss, misuse and alteration of personally identifiable information that is under our control. Unfortunately, no security system, or system of transmitting data over the Internet, can be guaranteed to be 100% secure. As a result of the foregoing, while we seek to protect your personally identifiable information, we cannot guarantee the security of our servers, the means by which information is transmitted between your computer and Thrill Experiences servers, or any information provided to us or to any third party through or in connection with the Site. You provide all such information at your own risk. If you have registered with Thrill Experiences, you may update your mailing address, email address, name changes or telephone number by visiting our Site at www.thrillexperiences.com.au and clicking on "My Account" at the top of the page. This will take you to our Customer Service page, where you can log into your account to review and update your personal information. Thrill Experiences Pty Ltd (ABN 27 117 180 588) is a business domiciled in Australia. Thrill Experiences is committed to a quality customer experience. We are constantly reviewing your feedback to improve and enhance your on line experience. You can tell us what you think by sending us an email or contacting our customer care department.